Here’s where the game of baseball is these days: The Yankees used 26 different pitchers this year, the eighth most in franchise history. That is also the fifth fewest pitchers used by any team this season. The Blue Jays led the way with 36 different pitchers in 2018. The Rockies used only 21 different pitchers, the fewest in baseball, if you can believe that. Wild. Two of those 26 pitchers to wear pinstripes in 2018 were shuttle veteran Luis Cessa and newcomer Jonathan Loaisiga. Both went up-and-down this year — Cessa moreso than Loaisiga — but they held different roles. Cessa was the quintessential spot starter. Call him up, start him, send him down. Loaisiga had a somewhat extended run in the rotation. They finished with similar numbers (5.24 ERA/3.74 FIP vs. 5.11 ERA/3.53 FIP). Let’s review their seasons. Cessa’s third year as an up-and-down depth arm featured eight (!) separate call-ups — four times he was called up to make a spot start or long relief appearance and sent down the next day — and 44.2 innings with a 5.24 ERA (3.74 FIP) spread across five starts and eleven relief appearances. He also missed two months with an oblique injury and threw 26.1 innings with a 2.73 ERA (2.38 FIP) with Triple-A Scranton. Typical Luis Cessa stuff, basically. The Good: Cessa started the season with two 1-2-3 inning short relief appearances, during which he struck out three of six batters faced. He also strung together back-to-back good starts against the Orioles (6 IP, 3 H, 0 R, 0 ER, 3 BB, 4 K) and Rays (5.1 IP, 4 H, 2 R, 2 ER, 0 BB, 3 K) in July.
? Also, Cessa had a nice little run as a multi-inning mop-up guy late in the season. He even recorded his first career save when he threw the final three innings of a blowout win over the O’s on August 25th. 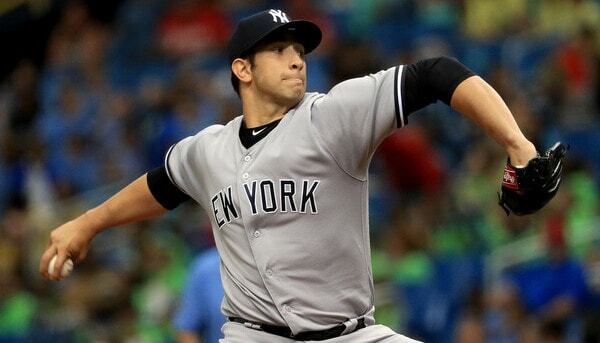 From August 25th through September 29th, Cessa made six appearances and threw three innings in five of them, and posted a 3.18 ERA (2.16 FIP) with 18 strikeouts in 17 innings. Opponents hit .250/.271/.382 against him. That’ll work. The Bad: Pretty much everything else. The Red Sox hung five runs on Cessa in 3.2 innings on August 2nd. Next time out the Rays punished him for five runs in 3.1 innings. And, on the final day of the regular season, Cessa allowed four runs in one-third of an inning and left the game with a hip injury after he stumbled covering first base. Fourteen of the 27 runs he allowed this year came in those three games. That’s 52% of his runs in 16% of his innings. The Future: This past season was Cessa’s final minor league option year, which means he has to pass through waivers to go to Triple-A going forward. This is not a good place to be, out of options and unestablished at the MLB level. I like Cessa more than most and I wish the Yankees would just stick him in short relief. The velocity is good and his slider has a comfortably above-average swing-and-miss rate. Stick him in the bullpen and see what happens when he airs it out for an inning at a time, you know? Cessa will turn 27 in April and he did keep his 40-man roster spot through yesterday’s Rule 5 Draft protection deadline, but that is hardly a guarantee he will make it through the offseason. The Yankees could cast him aside to clear 40-man space in the coming weeks. For now, Cessa remains in the organization, and since he’s out of options, he’ll get a chance to win the proverbial last guy in the bullpen spot come Spring Training until further notice. What a rise for Johnny Lasagna. At this time last year he was intriguing lower level arm who’d just returned from Tommy John surgery and had thrown 103.2 innings in his career, only 2.1 of which were above the short season leagues. Loaisiga was mentioned as a sleeper and the Yankees liked him enough to put him on the 40-man roster despite the injuries and inexperience. After four dominant starts with High-A Tampa (1.35 ERA and 1.18 FIP) and six okay starts with Double-A Trenton (4.32 ERA and 3.33 FIP) this year, he was in the big leagues. Crazy. The Yankees were of course extremely careful with Loaisiga while in the minors. He has a long injury history and hadn’t thrown many innings in his career, so he made almost every minor league start with six days rest this year. Loaisiga was a once a week starter, basically. Also, in his ten minor league starts before being called up, he never threw more than five innings or 89 pitches. The Yankees treated him with kid gloves. That didn’t stop them from calling him up. A promising four-start cameo — Loaisiga replaced Masahiro Tanaka in the rotation after Tanaka pulled both hamstrings running the bases — and a pretty crummy September bullpen stint gave Loaisiga a 5.11 ERA (3.53 FIP) with 33 strikeouts and 12 walks in 24.2 big league innings this year. It was a 3.00 ERA (2.88 FIP) in 18 innings as a starter and a 10.80 ERA (5.26 FIP) in 6.2 innings as a reliever. 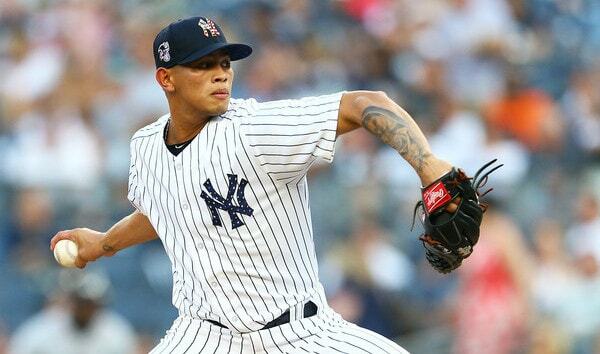 The Good: In his big league debut Loaisiga struck out six in five scoreless innings against the Rays on June 15th. He looked poised and his fastball topped out at 97.7 mph, which was pleasantly surprising. Loaisiga’s best start was his third start. He tossed five no-hit innings in Philadelphia before giving up a sixth inning leadoff single to Jorge Alfaro. His night ended with that one hit allowed in 5.1 scoreless innings. He struck out eight.
? In September, Loaisiga struck out four in two scoreless innings in Oakland on September 3rd. I was hoping he’d emerge as a multi-inning relief weapon in those final few weeks of the regular season — a higher end version of Adam Warren, basically — but it didn’t happen. Two very good starts and one nice two-inning relief appearances were the highlights of Loaisiga’s big league debut. The higher the spin, the better on fastballs and breaking balls. For changeups, lower spin is better. (Low spin is okay on fastballs too. You don’t want average spin on heaters though. High or low, nothing in between.) Loaisiga showed three legitimate Major League pitches in his brief time with the Yankees and he got swings and misses with everything. The kid also seemed very composed on the mound. Innings rarely spiraled out of control. The Bad: In two of his big league starts, Loaisiga needed 84 pitches to allow three runs in 3.2 innings against the Mariners and 92 pitches to allow three runs in four innings against the Braves. Also, he got hit pretty hard in September. I’m talking eleven runs (eight earned) in four appearances and 4.2 innings after those two innings in Oakland. That included a six-run, 1.1-inning disaster against the Twins on September 11th. Ouch. To me, Loaisiga’s struggles looked more like a young and inexperienced pitcher learning the ropes than anything. I didn’t see a flaw in his stuff. He executed some good fastballs and breaking balls off the plate, pitches hitters probably chase in the minors, and big leaguers didn’t bite. Considering his relative lack of minor league experience, it is not at all surprising Loaisiga was inefficient and a little lost at times. He’ll get better with time. The Future: Loaisiga turned 24 earlier this month and he made it clear this season he has big league potential. The stuff is there and the composure was there. He’s a little green, which is to be expected. I definitely think Loaisiga has the stuff and command to start long-term. I just have no idea whether he’ll stay healthy. The injury history is ugly. Shoulder and elbow problems. He even missed time with shoulder fatigue after being sent back down this summer. The range of potential outcomes for 2019 Loaisiga seem awfully large. I wouldn’t be surprised if he blows out his arm and misses the season. I also wouldn’t be surprised if he throws 150-ish innings with a mid-3.00s ERA. The talent is there, unquestionably. Can he still healthy? Does all the missed time earlier in his career hold him back? Loaisiga has never pitched in Triple-A. Not one single pitch. I imagine he’ll spend most of next season there. To me, Loaisiga seems like an excellent candidate for an opener. By that I mean a reliever starts the game, faces the top of the lineup, then turns it over to Loaisiga for four or five innings. That might be the best way to use him next year. Then, once he gets a little more comfortable and gains a little more experience, the Yankees will hopefully be able to turn him loose as a full-fledged starter. The little bit we saw this year was promising though. It was a remarkable rise from relative unknown to big leaguer for Johnny Lasagna in 2018.